You are the boss, you got the control! Do you want to stop your users from editing BuddyPress profile fields? BuddyPress Non Editable Profile Fields plugin allows site admins to mark a profile field non editable. Once a profile field is marked non editable, the user can not modify its value. The profile field can be updated(if no value is set, only in that case) for one time but once the value is set, It can not be modified. This plugin is most suited when you want to lock some profile fields and disallow users from editing. Allow admins to mark a profile field as non editable. 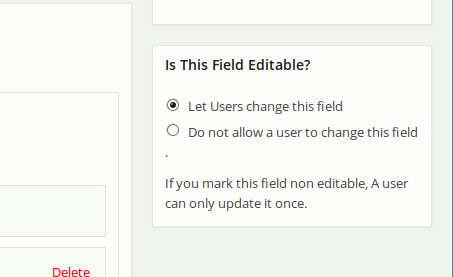 Do not allow users to change the profile field value if the field is marked non editable. Once a profile field is marked as non editable by the admin, It allows user to save the data for one time. Once the profile field data is saved, the user can not modify or change that. and all the cases you can imagine.